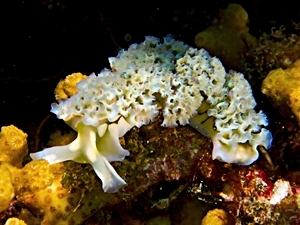 Lettuce Sea Slug (Elysia crispata) from Dominica island. 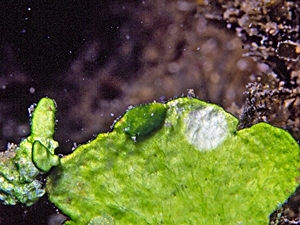 Sap-sucking slugs (Sacoglossa) usually are small (between one and three centimetres length) slugs in the sea and in fresh water, whose shell is more or less reduced, even though there are species able to withdraw into it. If present, the shell usually is very thin walled. In many other species, the shell remains hidden beneath the mantle, like it does in sea hares. Like them, sacoglossans sometimes use their parapodia to swim. The most important common character in sacoglossans is the crop sack, due to which is their name, and in which the radula's front end sits. In the crop sack also the spent radula teeth are stored, which is why its volume grows with the gastropod's age. nia alga. Source: Händeler et al. (2009). Sacoglossans may have one or two pairs of tentacles, in some species, the tentacles are even completely reduced. Ria Tan: "Slugs: nudibranch, sea hare or sap-sucking slug? How to tell them apart?". 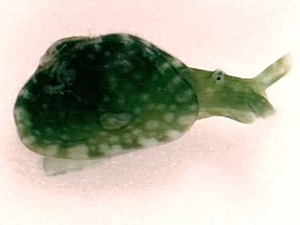 Sacoglossans mainly live near the coast, where they feed on algae. They are also tongue-twistingly called sap-sucking slugs because they feed by puncturing plant cells and sucking the cytoplasm from them. Therefore, their radula is reduced to one single row of teeth. The shell-bearing species almost exclusively feed on green algae of the Caulerpa genus, the loss of a shell seems to have coincided with a radiation of food plants: Sacoglossan slugs feed on different alga species from the Ulvophyceae group, some even feed on red algae. As an exception from the rule, there are also three predatory species of sacoglossans. Jensen, K. R. (2006). "Biogeography of the Sacoglossa (Mollusca, Opisthobranchia)". Bonner zoologische Beiträge 55 (3-4): 255 - 281 (PDF). Unterschieden werden 284 gültige Arten von Sacoglossa. Händeler K., Grzymbowski, Y. P., Krug, P. J.; Wägele, H. (2009) "Functional chloroplasts in metazoan cells - a unique evolutionary strategy in animal life". Frontiers in Zoology 6: 28. (Link). 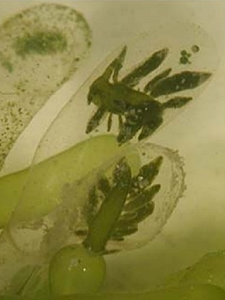 To sacoglossans, algae not only mean food. Similar to sea hares, they also use chemical compounds from their food to protect themselves against predators. flage. Picture: Parent Géry (Source). 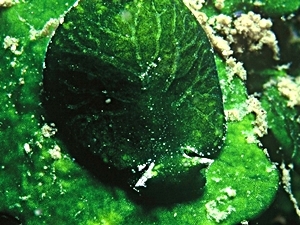 In a special way, many sacoglossans have perfected the use of algae for camouflage, by placing chlorophyll from plant cells in their body cells and so joining the colour of their alga-rich background. In many species, also the body form has adapted to better suit into its surroundings. Where is Bosellia mimetica? Picture: Parent Géry (Source). So Bosellia mimetica (Mimesis means camouflage by pretending to be a lifeless object) is hard to tell apart from the algae it feeds on, besides it is only 8 mm long. Bill Rudman: Bosellia mimetica on seaslugform.net. Also, many sacoglossans have developed the ability to incorporate entire chloroplasts from algae in their body (a phenomenon called cleptoplasty - plastid stealing) and to make use of their photosynthetic products. Of such "solar powered slugs" there are several species among the sacoglossans, in the Elysia genus there are for example Elysia viridis in Europe and Elysia chlorotica on the American west coast. By spreading the parapodia, the slug can also increase the photosynthetical output of chloroplasts by "sunbathing". In the Elysia there is also the conspicuously looking lettuce sea slug (Elysia crispata) displayed above, which does not steal chloroplasts. Movie: "The Lettuce Sea Slug". Source: YouTube. The incorporation of chloroplasts only is possible by the slug's body cell taking over genetic information from the plant cell. This horizontal gene transfer is highly uncommon between animal and plant. Nevertheless, the chloroplasts die off after some time and have to be replaced by the slug. Very interestingly, there is a species living exclusively off green algae which for the most of the year have calcified cells the slug cannot penetrate. So in that time the slug has to live exclusively off the photosynthetic products of the chloroplasts it had been able to procure earlier. Gavagnin, M.; Marin, A.; Mollo, E.; Crispino, A.; Villani, G.; Cimino, G. (1994): "Secondary metabolites from Mediterranean Elysioidea: origin and biological role". Comparative Biochemistry and Physiology Part B: Biochemistry and Molecular Biology 108: 107. (Link). Rumpho, M. E.; Dastoor, F. P.; Manhart, J. R.; Lee, J. (2007): The Kleptoplast. 23. p. 451 (Link). 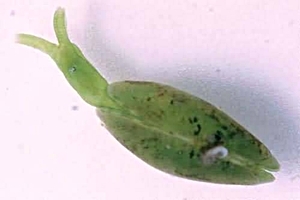 Sacoglossan distribution is highly dependent on that of their food plants. Most species live near the Equator in the coastal area of tropical islands. From North to South the species diversity decreases, often species living away from the Equator are tropical species with a higher temperature tolerance. Australia. Picture: Leon Altoff (Source). According to the systematics of Bouchet et al. (2005) the Clade Sacoglossa is divided in two subclades, namely the Oxynoacea (about 20% of all Sacoglossa) and the shell-less Pleurobranchacea. While in the Oxynoacea the shells of Volvatellidae and Oxynoidae externally are approximately similar to those of bubble shells (Bullidae, Cephalaspidea), the Juliidae are quite interesting, because as only exception in gastropods they have a bivalve shell. lia. Picture: Leon Altoff (Source). As fossils, therefore, they have often been confounded with bivalve mussels, but today (and it has only been known since 1959 that there is such a thing as a present day species of Juliidae) it is plainly visible that those are gastropods having a head, eyes and tentacles. While the left shell valve is homologous to the actual gastropod shell, the right one is a new construction of the mantle. From geology, sacoglossans have been known since the Eocene (about 34 - 56 mill. years ago, see. Geological Timeline). The examination of fossil sacoglossans is rather difficult because the shells are so fragile and also the species live in places (near the coast) with a high rate of erosion and so fossils are very likely destroyed if even they should be petrified. What can be done, however, is to research the distribution of fossil algae species, known to be food source to sacoglossans. Then the latter's distribution can be deduced with some certainty from the Cretaceous or the Jurassic on. Jensen, K. R. (1997): "Evolution of the Sacoglossa (Mollusca, Opisthobranchia) and the ecological associations with their food plants". Evolutionary Ecology 11: 301–335. (PDF). Science has been able to prove that shell-less sacoglossans all had a shell during their larval stage, discarded during metamorphosis, as is the case in the equally shell-less sea angels.